We feel so fortunate “Capturing life at it’s best “for our clients and sharing in all life’s happiest moments and documenting them for families for years to come. Sarah was unavailable for this wonderful couple’s wedding and was so happy that they came back to us for their growing family. Sarah photographed Heather, Seth and big brother as they are now pregnant again with their second child. She was lucky to photograph their oldest son a couple of years ago and is now available for the next stage in their family’s life yet again! Congratulations to the proud parents on the birth of their daughter, Arielle! Big brother posed with his dad and grandpa for a great photo op. All the kids had a blast playing with all the festive balloons. We love photographing special occasions and events with this family of now four! Mazel Tov! Check out the cool photo cake and delicious food spread! YUM! 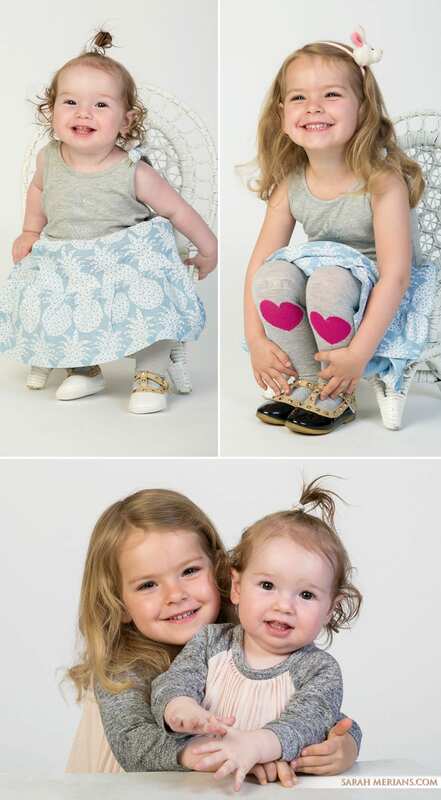 We love these two adorable sisters who posed for Sarah’s camera at our studio earlier this spring. Photos of the people you love are the perfect Father’s Day gift. It’s not too late to schedule a shoot or order prints! Justin is getting older by the minute and we have been here through the years to document all of his birthday celebrations. We can’t believe he is now 10! Time flies. This year’s party had a basketball theme and guests got to learn and practice their skills. We loved the cake complete with a basketball backboard and net. Happy 10th, Justin! Happy 7th Birthday, Kiara! We love how Kiara and her friends decorated their own chefs hats and aprons and baked their own homemade cupcakes and pretzels. The party came to a close with a round of “Happy Birthday” as Kiara blew out her birthday candles. Brother Tressa celebrated his birthday too with his own cake! February is many things… including the month of football! We wanted to honor that with some adorable shots of these two brothers posing together in their NY Giants jerseys. Who is your favorite football team? Alexandra Turns 5 at the Central Park Zoo in the Snow! Let is snow, let it snow, let it snow. We photograph Alexandra’s birthday party every year and for her 5th, she celebrated at the Central Park Zoo with friends at an animal-themed party paired with winter snow. We loved the stuffed animal goodie bags! Check out some great photos from the party below. Portia turned 1 and celebrated with family and friends at an appleseeds birthday here in NYC! Portia got to jump in and out of the ball pit, and participate in music and story time before blowing out her birthday cupcake. Happy Birthday, Portia! New year… new baby… new parents-to-be! We love this family and couple. Photographed their wedding at Temple Emanu-El of Closter, NJ two years ago.